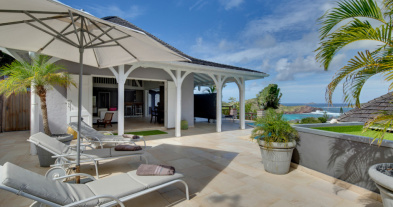 You will love the large sun deck of the Villa BELLE CREOLE with its island and sea views, it’s surrounded by manicured tropical gardens, giving you and your guests ultimate privacy. Lay on one of the mobile lounge chaises on the wooden terrace of the Villa BELLE CREOLE, close to the large pool. The spacious verandah on the top floor provides more comfortable furniture for relaxing in the shade as well as a dining table for enjoying alfresco meals in the great outdoors. Recently renovated, this charming home features serene neutral tones and colonial and plantation style furniture. The living room has plenty of seating (including a couple of rocking chairs) as well as a flatscreen TV for some evening downtime. The dining room boasts beautiful views from the sliding doors that also provide natural light. The open kitchen, next door to the indoor dining room, features all the necessary tools to create a home cooked meal. 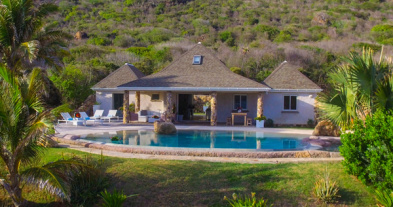 With six air conditioned bedrooms, this villa will comfortably sleep up to 12 guests. Each suite features a queen sized bed, quaint decor and rooms on the top floor have the added bonus of extra high ceilings; four of the rooms also offer private en-suite bathrooms. 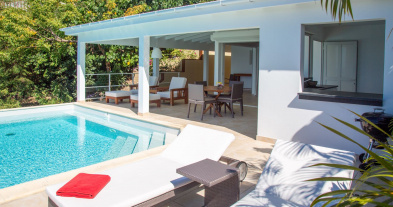 Villa BELLE CREOLE, also known as WV LBC, is a 6-bedroom villa located in St. Jean within minutes of the beach and shopping. 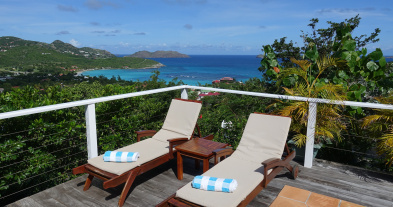 This 2-level villa enjoys a view of the St. Jean airport and the Eden Rock Hotel. The living room opens to a terrace and an outdoor living area. The kitchen is located between the living room and indoor dining room, which comfortably seats 6 guests. The covered terrace, located just of the kitchen, houses an outdoor dining area facing the view. Three bedrooms are located on the third floor, while the other 3 bedrooms are found on the deck and pool level. The master bedroom has a king-size bed and en suite bathroom. The other 5 bedrooms have queen-size beds and en suite bathrooms with the exception of bedrooms 2 and 3, which share a bathroom. Large Living Room, Air conditioning, TV screen, DVD player, French Satellite, WIFI, Access to the covered terrace, Ocean view. Dining area table for 6 people, access to the covered Terrace, Oceanview. Fully equipped Kitchen opening onto the terrace, Fridge, Freezer with Ice Maker, Dishwasher, Toaster, Oven, Microwave, Blender, Nespresso Machine, Coffee Maker, Gas Cooker. King size Bed, Closet, Air conditioning, Safe, Ensuite bathroom with a shower and two sinks. Ocean view. On the first floor, Queen size bed, Closet, Safe, Air conditioning, Ensuite bathroom to share with bedroom three, a shower and one sink, Ocean View. On the first floor, Queen size bed, Safe, Air conditioning, Ensuite bathroom to share with bedroom two, a shower and one sink, Garden view. At the pool level, Queen size Bed, Safe, Closet, Ensuite bathroom with a shower and one sink, Air conditioning, Direct access to the terrace, Pool and ocean view. At the pool level, Queen size Bed, Safe, Closet, Ensuite bathroom with a shower and one sink, Air conditionin, Direct access to the terrace, Pool and Ocean view. At the pool level, Queen size Bed, Safe, Closet, Air conditioning, Ensuite bathroom with a shower and one sink, Direct access to the terrace, Pool and Ocean view. Very nice Swimming Pool with view on bay of St Jean , Surrounded by a large terrace with deck chairs. On the main level, another covered terracce with a dining table for 6 people and outdoor living room, Ocean view.